I like Obituary as much as the next metalhead. At least when they are doing something entertaining. Unfortunately at times, Obituary gets bogged down in a groove and refuses to let it go. The result is extremely tedious. At least having Ralph Santolla around to make things more interesting with a blazing guitar solo evens some of that out. Now why in the hell did I open an Unburied album review with a discussion of Obituary? 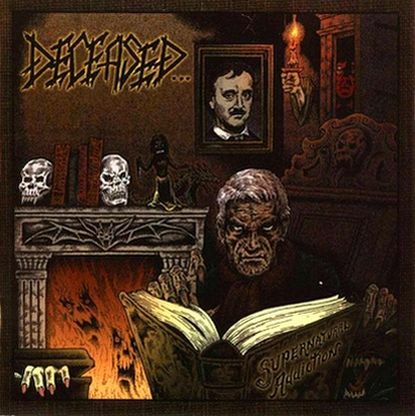 Because Unburied sound like Obituary. At their most ridiculously boring. That is not a good sign by the way. Imagine an entire album full of Obituary-stuck-in-a-groove with absolutely no release. Does not sound like much fun does it? After hearing this album I can attest that no, no it is not much fun. I happen to like death metal with a fair amount of groove (I love Jungle Rot), but Unburied really takes it way too far. There is a school down the street where one can immerse one's child in Spanish speaking classes so that from an early age, she learns that language along with English. The program benefits native Spanish speakers by teaching many subjects in that language, and it benefits the native English speakers by teaching them Spanish. Society as a whole benefits, so the theory goes, because there will be better understanding among these two different cultures who although live so closely would otherwise not interact. I have no idea what Cultura Tres means, having been taught no Spanish while attending high school in Japan. Make me guess, and I'd say "Three Cultures". What does that mean? I have no idea. I have no idea what "El Mal Del Bien" means either but if I were to guess, I'd say "The Evil of Good", but that makes no sense. Neither do a lot of these other song titles. What does makes sense is the slightly above average sludge post metal we hear on this release. With success come expectations. Vreid’s incredible V was lavished with praise from all corners; making my own top 10 of 2011 was probably the least significant. I don’t envy the position where the Norwegian black ‘n’ rollers found themselves in following that success. Do you follow it with more of the same, cursing yourself to the handicap of easy comparisons and betting on your ability to become even better (Master of Puppets)? Or, do you change direction (South of Heaven)? Vreid certainly did not change direction. For the uninitiated, Vreid’s brand of black ‘n’ roll is the super-slick kind typically found on Indie Recordings, but it would be equally at home with Century Media or Roadrunner. The “for fans of” sticker would include Satyricon in big and bold, with Borknagar and Dark Fortress in smaller print. They can re-use the leftover stickers on their latest release. I may be in the minority here but I never tire of retro German thrash. And no, I am not being sarcastic. Yes, the old masters Kreator, Sodom, and Destruction did it better. But I love it when a band decides to play music clearly influenced by that old bestial, neck-wrecking style. Eliminator is one of the better new bands that play a style similar to the German Big Three. 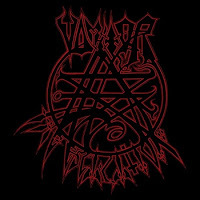 In fact, with the vocals and musical style, they sound like a slightly more-refined Kreator in their early days when Ventor provided the vocals instead of Mille Petrozza. It is slightly more-refined due the fact that this band sounds like it has had a bit more practice, tightening things up than Kreator in those days. It is not as raw and unpredictable. Eliminator is maniacally fast. This is definitely not the same fluid style as Metallica or the other Bay Area bands. It is nasty and hyperactive thrash that is full of aggression and anger. The first time I heard this album I thought they were probably Swedish. Then I listened to them a couple more times and determined that was most likely not the case. I began to detect the subtle hints of a more Dutch sound, shades of Hail of Bullets really. Then I actually did some damn research and that set everything straight for me. Sure enough, Weapons to Hunt is a Dutch death/thrash metal similar in sound to Thanatos and Asphyx among other groups. This is the first album for Weapons to Hunt, though three of the four members were in the previous incarnation of the band called Infinited Hate. Someone somewhere along the way probably pointed out that "infinite" is not a verb and you cannot "infinite" or previously "infinite" so the band name did not make sense. Prepare to be Dominated! 4 out of 5 stars. Dear A Band of Orcs. You had me at "hello." Immediately I was drawn to your metal name, redundant as it was. One could ask the question, "How much more metal could your name be?" And the answer would be, "None more metal." (He might also ask, "Why use 'A Band of' and not just "Orcs," but that would be nitpicking and you don't want a relationship with someone who is going to nit). You might have well given yourselves the name "A band of metal". Your point has been conveyed artfully and succinctly, unlike this review. Not content to simply wow me with your band name, you go ahead and turn on the charm with your album title. "Adding heads to the pile" - glorious. It's new, it's totally something Orcs do, and it's metal. It rules. Throw in a an old fashioned hand drawn/painted cover with two orcs, one using a Dekapitor ax to behead some dude and another orc wielding a guitar ax, and you have won A LOT of points before I've even played a note. Of course the most metal band, album name, and cover art are only going to get you so far. The tunes still have to rock. They have to swagger. They have to metal. They have to rule. I’ve been putting these reviews off forever. Two of these bands contacted me in July. Rather than continue to delay, I’m just going to handle all five of them machine-gun fashion. Coincidentally, all of these bands are from the US, all of them are on Bandcamp, and all of these releases were from 2012. Grindcore. Eight minutes. Heavy, with plenty of dynamics for such a short release. The cover art says “Boddicker A.K.A. Napalm Frost,” so you know where their allegiance lies. I’m no grind expert, as I’ve repeatedly said, but I love this quickie. When I sat down to do the update last night, my Internet connection was on the fritz. And right now I don't have access to everything I need. So, no new review today. Assuming all is well, there should be a normal update tomorrow. Aeon is a Swedish death metal band. Now when I say that, many people will have a certain sound in mind for what they think that the band will sound like. They would be wrong in this case. You see when I say that Aeon is a Swedish death metal band, what I mean is that Aeon is a death metal band that happens to be from Sweden. Their sound owes far more to the early New York death metal scene than to the Swedish scene. Think Immolation, Suffocation, and Incantation. There is a little bit of technicality, but that is more along the same lines as saying that Cannibal Corpse is technical. Aeon's music deals with anti-Christianity, which is certainly nothing new in the genre. So the music is of course dark and heavy. Unfortunately this is all just more of the same from Aeon who have been doing this type of death metal for years now. Most of their albums sound basically the same as well. This one added a little bit to the mix, mainly short acoustic tracks to break up the monotony of the pounding riffs. As far as I’m concerned, Surgeon came out of nowhere. As I write this, the Philly band doesn’t even have a Metal Archives entry. But apparently these unknowns were promising enough to attract the attention of Steve Albini, who lent his talents to the recording process for a prior EP. 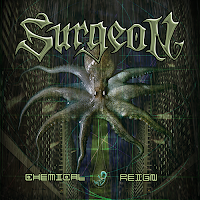 Debut LP Chemical Reign is my introduction to the band. I hadn’t read much of the press material before giving this a listen, but I have to say I was shocked when I pressed “play.” Ignore the band’s name, the album name, and the album art. 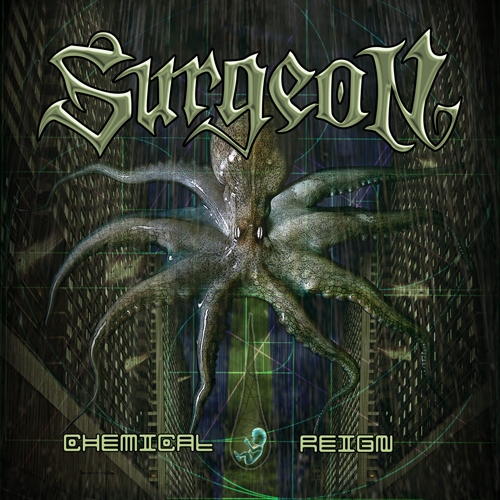 Surgeon has nothing to do with technical death metal, or death metal at all. This is pure heavy metal, in a modern vein. They inhabit that rare space that could attract rock radio attention as well as a good share of the trve among us. I know that’s true because I can’t get these songs out of my head. This is not a new release, rather this is the reissue of Deceased's fourth album. The more I hear from this band, the more I love them. Which is saying something because I have been completely on board with their style since the first time I heard them a few years ago. How this band continues to put out terrific album after terrific album with almost no notoriety whatsoever is completely beyond me. But we are not really here to discuss that. What we are to do is to take a look at this release. I have not heard everything released by this band yet, but this is probably the most melodic album that I have heard yet from them. The guitar leads in particular are incredible. The beginning melody to opening track "The Premonition" grabs the listener right away and refuses to let go. It is a harbinger of things to come on this release because the album never lets up. Deceased plow through this album like a rampaging beast. The album is fast and furious. 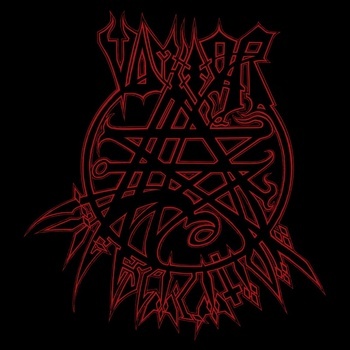 Vomitor is yet another filthy and dirty band blending extreme metal styles from Australia. The band is made up of members who have spent time in Bestial Warlust, Gospel of the Horns, Portal and others, demonstrating the ever-fluctuating nature of extreme metal in Australia. So right away, you know this is going to be some nasty stuff. And with a name like Vomitor, you can pretty much bet that they will be about as subtle as a sledgehammer to the groin. Vomitor makes a lot of noise. So much that listening to them is likely to net you a disturbing the peace charge. That would be a Misdemeanor III in Nebraska, punishable by up to 90 days in jail or a $500.00 fine or both. Sorry, lawyer moment there. If you have never heard Portal , I can no more explain their sound to you than I can explain the sensation of a mouthful of worms to a man with no head. He cannot apprehend the writhing, the filth, the otherworldly horror. He can’t hear my words, nor can he understand anything without a mind. For those who have heard Portal, you need only know two things about Vexovoid. They are contradictory, but simultaneously true. It does not represent a change of direction, yet it is also a huge departure. This is a Portal record, through and through, operating on the same kind of inscrutable alien logic as Swarth, The Sweyy, and The End Mills. And, like every other album they’ve released, it is better than the one that preceded it. Let me paint you a picture: Three metal nerds sit around with a 2 liter bottle of Shasta, watch a few horror movies, smoke weed, and listen to Rush. They proceed to pick up their instruments, jam for a while, and maybe add some synthesizers in post. They call themselves Chowder--like the soup--because they obviously take themselves and their music quite seriously. The album they make, Passion Rift, is about as exciting and dangerous as that sounds. In all honesty, I could end the review right there. But I suppose there are those of you who think it might be fun to listen to an album of progressive doom metal created by Rush nerds who approach their craft in the same way as improvisational jazz musicians approach theirs (that is, as a social event rather than a musical one). I plan to post another review later today. It's a rerun of one I wrote for another site, but it's well worth reading. Check back in about 8 hours. Review by Patrick, proprietor of Beards, Etc. Grai are a female-fronted Russian folk metal group. The newly-released O Zemle Rodnoy is their second full album. More than anything else, this record reminds me of Cruachan. The female vocals have a similar sound, and the liberal use of flute as the primary folk instrument is in keeping with that band's musical approach. 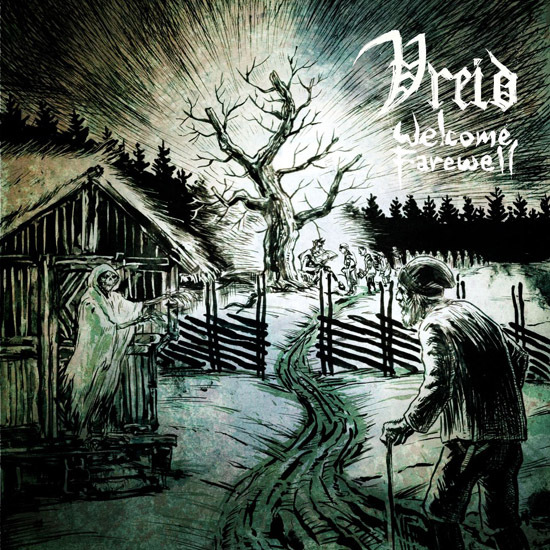 The overall effect is that this seems more like a Celtic folk metal record than something from Russia, though evidently the band actually employ numerous traditional Russian folk instruments throughout the album. Some of the absolute filthiest, most depraved metal in the world has been coming from Australia for the last couple of decades. There must be some reason for it. Perhaps it is because every single animal on the godforsaken island is constantly trying to kill people. Even the koalas should be feared. With death at every turn, it is bound to have an effect on the psyches of the people. Which has to be the reason that there are so many ungodly extreme metal bands to come from the continent/country/island thingy. 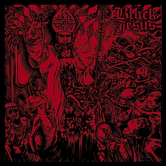 In 2010, Aussies Black Jesus released their demo in cassette form only. Hell's Headbangers did what it typically does and found some nasty demo, feeling that it deserved a wider release, and re-released it on vinyl. That is just one of the many reasons why I like the label so much, their undying devotion to the metal underground. Hey, you know what this is about. Truthfully speaking, it should be a crime that I've done so many of these without including anything by the great Dax Riggs (formerly of Acid Bath). Agents of Oblivion was a one-off project that stands somewhere between Riggs' former life (metal) and his current one (rock). It sounds quite a bit like Alice in Chains (see "Dead Girl"), sans the stomp, and with a stronger country aesthetic at times (see "Cosmic Dancer"). His voice is the real draw, as he is both technically and emotionally more accomplished than Layne Staley ever was. It's pretty damn dark, with a couple more lively songs (see "Slave Riot"). The only real head-scratcher is the choice of samples at the end of the record; I think they were supposed to be disturbing, but they just seem comical to me. Released on Halloween this year, this split features a band from the same dank depths (Cleveland, OH) as the almighty Nunslaughter, and another one from the even more depressing Pennsylvania. I was not previously familiar with either band so this split serves as a nice introduction to two very deep underground American blackened death metal bands. Sathanas has been around since the late 1980's and have released a number of full-lengths over that time, yet somehow eluded me. 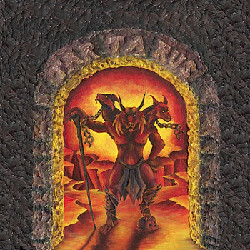 The Spawn of Satan has only been recording music since 2002 and has never released a full-length, though they have been active for almost as long as Sathanas. Bob Dylan once said "Don't criticize what you don't understand." Adhering to Mr. Dylan's advice here will be difficult because I've been asked to "critique" this release from Derelict, a technical death metal band from, where else, Canada. And I don't really "do" technical in my music. Full disclosure, I have tried many times but do not get bands like Opeth and Dillinger Escape Plan. Everyone and their mother, including Joan, thinks these two bands are great. I don't doubt they are, I just don't get it. Opeth bore me to tears. DEP just sounds like noise. Have I mentioned that I love the Australian "war metal" scene? I am sure it's come up before at some point or another. Well Hell's Headbangers loves it too and the label has been one of my principal sources for finding releases by these bands. The ones that they have not released new have at least been reissued. That is the case with this one. Bestial Warlust is one of the founding bands of the scene. They recorded two terrific albums in the mid 1990's that were nonetheless plagued by terrible production. But their sound on those albums was taken by a number of other Australian bands and improved upon. 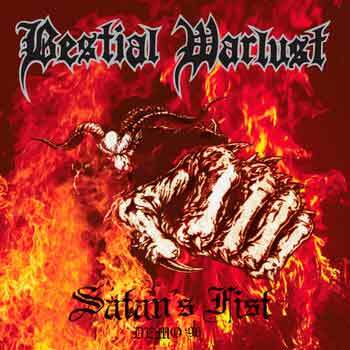 Without Bestial Warlust, we likely would not have had Deströyer 666, Gospel of the Horns, Abominator, or many of the other terrific bands to come out of the land down under with the same bestial apocalyptic sound.